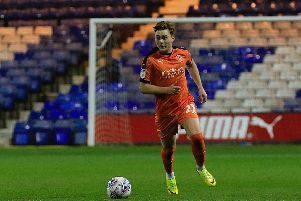 Luton full back James Justin has been nominated for the EFL Young Player of the Season award alongside Derby County's Harry Wilson and Norwich City's Max Aarons. The 21-year-old has been a regular in the Town side since the end of October, helping the Hatters' keep 18 clean sheets in the 31 league and FA Cup matches he has started so far. Justin has played 45 times, scoring three goals, as he also completed his century of appearances, having made his debut at the end of the 2015/16 campaign. His contributions were recognised by the EFL back in November, as he won the EFL Young Player of the Month, and Luton boss Mick Harford said: "We are absolutely thrilled and delighted that James has been nominated. "It's fully deserved in terms of the way he has played and that's testament to how hard he works on the training ground, he comes in everyday and he is a credit to himself, to his family and the football club. "He is such a grounded kid, we believe he will have a very long and successful career in football. "He's got the perfect attitude for a young player and that reflects in the amount of times he has played for the club. "Mentally he is spot on, he's got the right attitude. "He's the whole package. He trains excellently, his humility around the place, he is just a real top lad to work with, the staff echo that. The nomination is fully deserved." Chief executive Gary Sweet added: "This is undoubtedly a fully deserved nomination and is a credit to not only James, but to his family, as well as the members of staff in the academy that oversaw his development during his time as a scholar and the first team coaching staff that helped him kick on further. "James' displays on the field are for all to see but his professionalism, unwavering determination and his humbleness off it make him a true pleasure to consider as a colleague. "He is a model pro who has set the standard for all other young pros to aspire to. "Back in 2008, we established it as one of our missions to see the academy thrive and produce players that were of a high enough calibre to feature for the first team. "James has gone beyond that target and been a regular for the club for three years, and as a group of directors and supporters of this club, we couldn't be happier to see him put forward for this prestigious award."